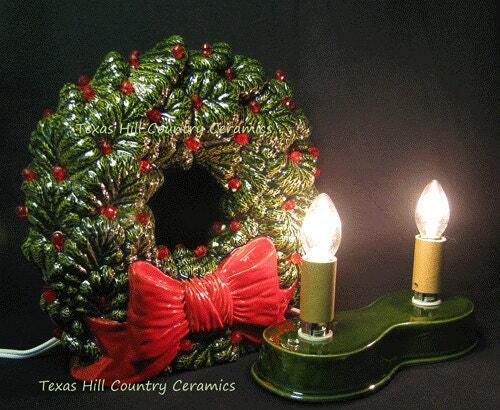 Do you love those old fashioned ceramic Christmas Wreaths sitting in a window showing off its lights? Then this green wreath with a big red bow is what you need. The double sided Sierra Spruce wreath sits on a slim base making it ideal for narrow shelves, window sills, fireplace mantels or limited confined areas. 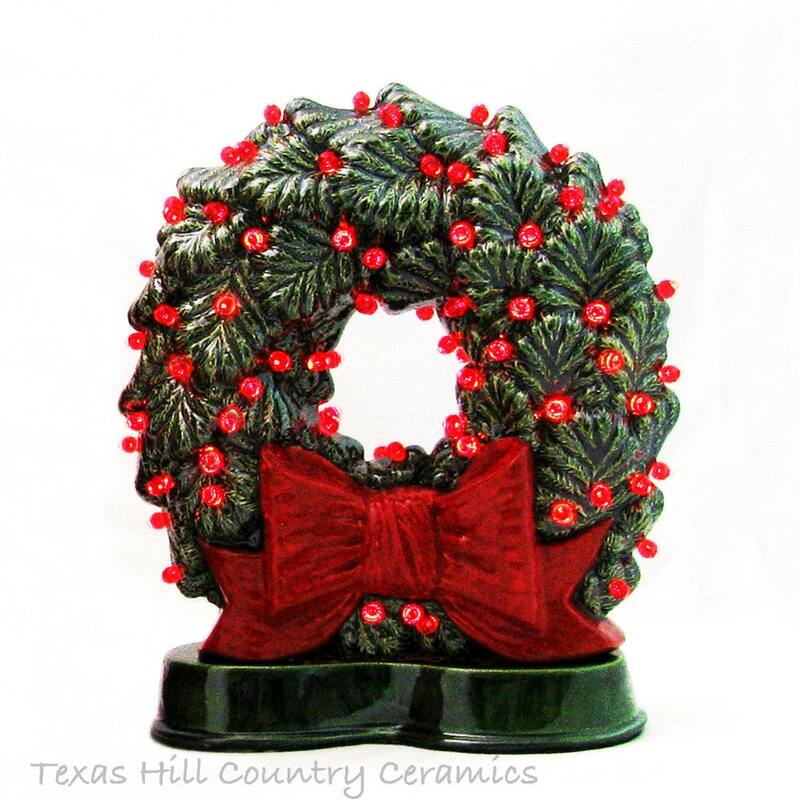 The ceramic wreath is two sided, the back and front have the same detail so it can sit in a window and viewed from both sides. The electric lighted wreath sets off the globes, choose either clear lights or red. Made to order, see processing time in the Shipping Section. This wreath will arrive ready to set up and enjoy. 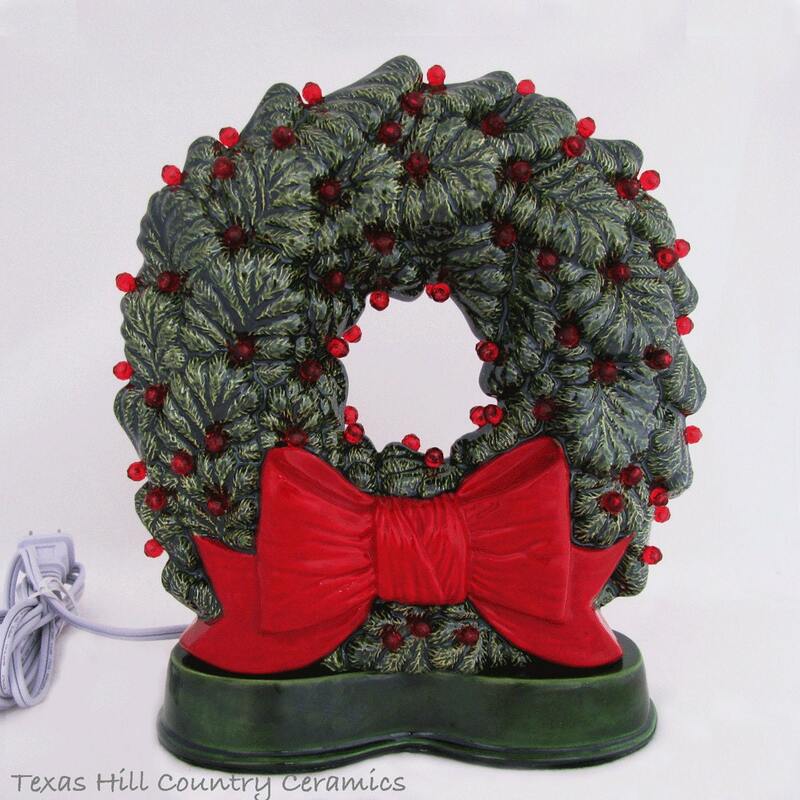 The narrow base fits the wreath perfectly and is hard wired with 2 UL approved light fixtures and for convenience the cord has a rotating dial switch so the wreath can remain plugged in and you can switch it on or off when you want. All bases are wired with a UL approved light fixture and plug that is standard for electrical systems used the USA. All light bulbs sent with the wreath are for USA electrical systems as well. Light bulbs are included. 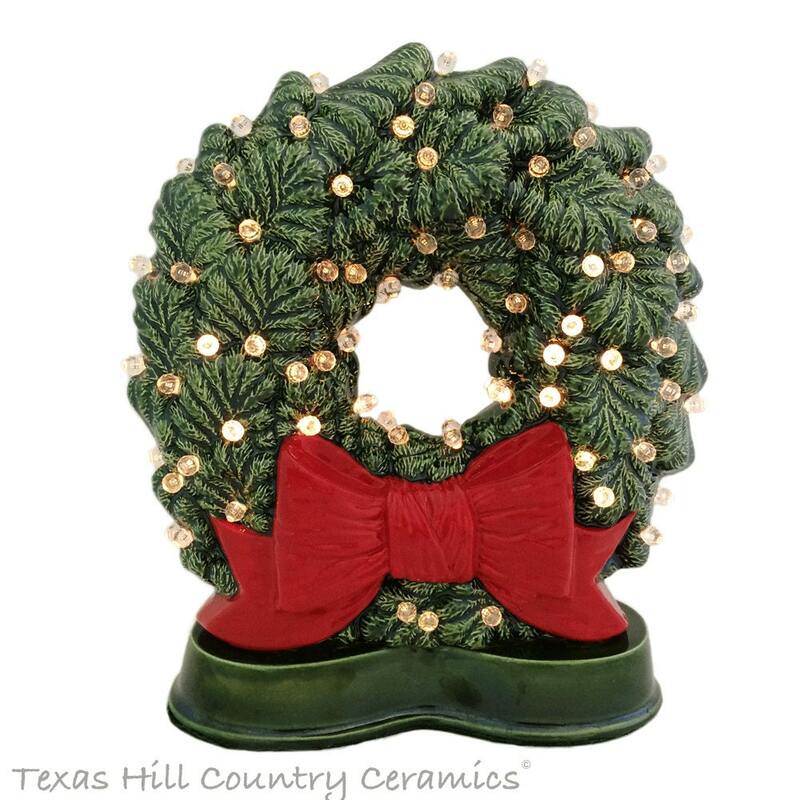 The ceramic Sierra Spruce Wreath is glazed in a rich green glossy non-toxic art glaze and round faceted globes are scattered over the wreath giving the appearance of berries and a big red bow is at the bottom of the wreath just above the base. Art glazes are glazes that produce more than a single-colored, smooth finish. Art glazes commonly produce lustrous finishes and dual coloring. This art glaze is a high gloss glaze. Art glazes are affected by the shape of the piece and the thickness of the glaze application, temperature and rate of the kiln firing. An art glaze will look one way on a smooth, vertical piece and entirely different on a highly embossed piece. All ceramics are made of earthenware clay in my studio located in central Texas, USA. Each piece is hand cast from a ceramic mold for uniformity and kiln fired. This piece is hand painted and the non-toxic art glaze that is applied with a brush for durability. Please note, each wreath is hand made and the placement of light globes on the one your receive will vary some from the one in the photo. Red lights and Bow on both sides! Beautiful! Bought this for my daughter for Christmas. She will love it. Thank you! I love it! The size & finish are perfect. I am looking forward to displaying it every Christmas. Thank you for such a beautiful item.